Monika is a spectacular tour guide. 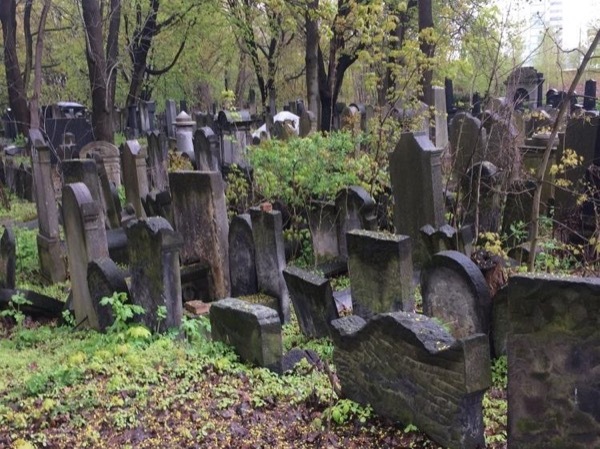 She fashioned a tour of Jewish Warsaw that kept my wife and I engaged and interested at every moment. She is very knowledgeable. Punctual. Great Transportation. Knowledge of history. TOUR GUIDE RESPONSE: Thank you very much. It was great to spend time with you! Monika was great! She promptly met us in the airport, was able to quickly find us a place to have breakfast since we landed at 8 am and have been up since 2 am. We had a fairly large group (9 people including kids ages 10-14) and she was able to keep everyone engaged. Her wealth of knowledge was incredible she was able to answer any question that we had regardless of the topic. I would highly recommend her to anyone looking for a tour of Warsaw or Jewish Warsaw tours. Monika is both knowledgeable and passionate about Polish history and about the horrors of Auschwitz and Birkenau. Only by visiting the death camps can one attempt to grasp the horrors perpetrated by the German Nazis on the European Jews. My friends and I feel so blessed to have been matched up with Monica K in Warsaw. We planned to come to Warsaw for months and realized we needed a guide a few weeks before the trip. Tours by locals connected us and Monika provided us an outstanding 3 day tour of Warsaw. She is extremely knowledgeable, and shares real life stories of peoples lives that provided us an extra level of understanding life in Warsaw. Without question, Monika is a local expert with passion and love for Warsaw and her clients. TOUR GUIDE RESPONSE: Hello! It is so nice to read your feedback. It was our pleasure to meet you and spend time together. Touring was real fun. Thank you for all the kind words. It was Great to show you around my Town. Huge hugs from me and Tomek!!! TOUR GUIDE RESPONSE: Thank you so much for an amazing Feedback. It was also Great time for us. It is always a pleasure to guide Guests like you. Thank you for all Great discussions. For all jokes and laughter. If you ever come back to Poland we will be happy to meet you again. All the Best. Monika and Tomek. Monika is, and was for us, a superb guide! She was very responsive to our interests and needs. We are not Jewish, but Monika's knowledge of Jewish language and tradition is remarkable and very much informed our understanding of World War II and the Holocaust, which we had studied in depth and which were the main objectives of our tour. Tomasz, Monika's colleague, is an excellent driver whose skill and welcoming personality made our tour so much more efficient and meaningful. If you have only one day in Warsaw, Monika makes it all worthwhile. Her detailed knowledge of history brings to life all of the different faces of the people of Warsaw. This tour was a great combination of walking and private transport. Her recommendation for lunch was also great local cuisine that was both quick and affordable. Monika has excellent English skills and was able to quickly determine our priorities for the tour. Thank you! TOUR GUIDE RESPONSE: Hello! Thank you for your feedback. It was a Great day for me and I am happy I met your expectations and you enjoyed the Tour. My Best regards! Monika was great! We toured Krakow, Poland for two days. Her extensive knowledge and enthusiasm made the trip wonderful. She was also flexible and sensitive to our needs. In addition, previous to our Krakow tour, we had Monika assist us with our genealogy agenda over a previous two day period. So for four days, Monika provided us a wonderful experience. Her mini-bus was a pleasure to be driven in. Would highly recommend Monika!! Rating would be top notch, 5 out of 5 stars. Knows her stuff and accommodating to individual needs!! Great service and very knowledgeable about Poland. Highly recommend. We had her the last four days. Would hire her again!! TOUR GUIDE RESPONSE: Hello! It is only couple of hours since I left you in Krakow and already miss you. Time spent together was amazing. Fact that we found you Relatives in Dzialyn- made this trip very special to me. All the jokes we made - we are just still driving back home and talk about them. Best regards from Tomasz (memeber of the Very Special Club) and me - hope to see you again! Monika is efficient, well organised, a good communicator with excellent English, very knowledgeable and, above all, very passionate about her city, it's history and culture. We had a day to see Warsaw and we rate it as a day very well spent. We have no hesitation in recommending her. We had a whole minibus just for the four of us. Good driver, relaxing tour, excellent experience with Monika. Monika was very pleasant, knowledgeable and enthusiastic and adapted our tour to suit our interests very well. Highly recommended. Monika is a very professional guide, very knowledgeable and accommodating. She made my visit to Poland informative and up to my expectations. She certainly deserves a 10 by my judgement. Monika is not a guide, she is a friend. Apart from being a great guide with a brilliant English and a great knowledge about Polish and Jewish histoty, she is a person who wants to do the utmost for her clients. She is creative, full of energy, all the time thinks of something more that might be interesting for her tourists. She is in love with her hometown Warsaw and talks and describe it as one who is deeply in love. Not only that she took us allover the town, all her culinary recommendations were great. An excellent tour! Monika is enthusiastic, very knowledgeable and most pleasant. Something special we noticed about Monika's tour was the depth and breadth of her historical knowledge - she is able to speak of Renaissance events to recent history in a seamless fashion. We also appreciated the comfort of the van we were driven in, and the safe courteous skills of our driver, who was excellent! This was a very high quality tour, and when we return to Warsaw, we'll be asking for Monika! Excellent and very interesting tour. Monika is very qualified. At the Wolfsschanze another very qualified guide takes over. We would really like to give Monika an 11 on a scale of 10. She went above and beyond on our Back to Roots tour. Not only did she help us find our grandfather's birth records in the State archives, she helped us find the granddaughter of our grandfather's sister in a tiny village. We were thrilled! Monika is a wonderful source of information. If you need help with searching your ancestry, try to hire her. You will not be disappointed! TOUR GUIDE RESPONSE: Dear Judith It was a great pleasure to work with you. Visit to Koziebrody was amazing. And I am so happy that we have managed to achive so much! Thank you so much for the amazing day we have had together and for all your kind words. Monika had to cancel at the last minute due to her son and father being in an auto accident but she found fabulous substitutes: Marek J took us around Warsaw and then to Sierpc to track down my family roots. Then he came with us to Krakow and showed us around there. He was wonderful: excellent English, very knowledgeable, and just a wonderful person. Anna B in Krakow was also wonderful. She accompanied us to Auschwitz. Monika checked in periodically to make sure all was going well. TOUR GUIDE RESPONSE: Dear Elinor. Thank you so much for your words of appreciation for Marek and Ania. I know them and was sure they will provide a very professional service. Thank you as well for your understanding. All the best! TOUR GUIDE RESPONSE: Dear Jeff thank you for the rating. It was my pleasure to guide you and your family. Hope that the rest of the journey was as well good. Please pass my best regards to your Mother, Wife and Sons! TOUR GUIDE RESPONSE: Thank you Jeff! It's hard to express how phenomenal Monika was. She took my parents on a personalized tour of Jewish Warsaw, Treblinka and a shtetl and they said it was mind blowing. My dad's quote was that he has learned about the Holocaust his entire life and he learned more in the hours with Monika than he had ever learned. She brought to life personal stories and details and married the statistics and the emotion. My parents then joined a high end tour company and they said Monika was significantly better. TOUR GUIDE RESPONSE: Dear Pam it was a great pleasure to guide your Parents. Thank you so much for all your kind words. Hope to see you in Warsaw. TOUR GUIDE RESPONSE: Dear Pam Thank you so much for your kind words. It was a pleasure to spend two days with your Parents. I had a great time myself and I am so happy I have met expectations as per the tour. Please pass my best regards to your Parents. And I hope one day we will meet in Warsaw. You are very much welcomed! My time in Warsaw could not have been better, thanks to Monika! What amazed me most was her encyclopedic knowledge of Warsaw and, more importantly, the depth of her feelings -- her pride and enthusiasm about the way in which the city was rebuilt following WWII and her compassion for the victims of the German occupation, the Ghetto Uprising and the Warsaw Uprising -- even after having given so many tours. Please do yourself a favor and book a tour with Monika: you'll be glad you did! TOUR GUIDE RESPONSE: Dear Stewart Thank you so much for all this amazing words you wrote. I am happy that I met your expectations as per the tour. It was real pleasure to show you my City as well as to share the time with you. I hope one day we can meet together so that there will be a chance to talk more and than I will be able to show you more amazing places in my town. Best regards and all the best for the New Year - Shana Tova! Monika was an extremely good guide. She was knowledgable, dependable and spoke excellent English. She was also very pleasnt to be with. I would highly recommend her. TOUR GUIDE RESPONSE: Dear Fred, thank you so much for all the complements. It was real pleasure to work with you. I've had a real good time and a lot of fun. I love your jokes! I hope rest of the tour will be an excellent experience. All the best! TOUR GUIDE RESPONSE: Muchas Gracias!!!! It was amazing experience also for me. All the best and hope to see you in Poland! TOUR GUIDE RESPONSE: Thank you very much. This trip was real pleasure. I have had lots of fun and enjoyed it very much. We have visited more places than an average person in Poland visits in 30/40 years - enough to say - we have made around 4000 km crossing Poland. And what is most important - SPAIN WON:-)Thank you so very much for this wonderful days we spent together! As a travel agent, I am always interested in establishing relationships with outstanding guides. Monika is one of those special people! She is very personable, understanding of limitations, and so knowledgeable. We learned so much about both Jewish and general history on our full day tour. The 5 of us thoroughly were captivated by her stories and animation. She had a large, comfortable van for us and the driver was friendly and cautious. I would not hesitate to recommend Monika and will to my clients. TOUR GUIDE RESPONSE: Dear Andrea Thank you so much for your kind words. I wish we had more time so that you can see other wonderful sites in the town. I am so happy I met your expectations. I wish you all the best for the rest of your tour! Monika was just terrific. If there was a 6th star she would get it. She has a great passion for touring. Her English is excellent. Her fund of knowledge is extraordinary. She even extended our tour at no extra charge because she felt there still were sites that we must see. She is a gem! TOUR GUIDE RESPONSE: Dear Alan it was a great pleasure to guide You. It was amazing day also for me. I am so happy that I could show you all the places included in the tour as well as to show You that, what you were interested in and you still did not see it. I wish you all the best for the rest of your tour in Poland as well as abroad! Monika is very knowledgeable and was flexible to reflect what we told her our interests were at the start of the tour. Her English is flawless and she added a lot of colour to historical events. TOUR GUIDE RESPONSE: Thank you very much. It was a great pleasure to work for you. Although it was quite cold and it was raining I enjoyed the time spent with you. All the best! Monika is one of the most knowledgeable guides I have ever had. But first and foremost, she truly understood my reason for been there and made sure to fulfill all my expectations, even after the tour was finished. She is a great professional also because she knows very well how to deal with extremely sensitive historical issues of great sentimental value. I strongly recommend her services. TOUR GUIDE RESPONSE: Dear Jack, It was a great pleasure to spend this three days with you, to guide you in Warsaw and to show you a little bit of Poland. And I am so happy I could help you to find all the documents on your relatives - this was amazing just to see how happy you are with all we have fond during your stay and after you left. Thank you very much and all the best! Monica has an incredible wealth of factual and historical knowledge. She could answer all questions not only specifically, but within the broader European context as well. She is warm and welcoming, and has a great sense of humour. Professional and relaxed, her name is "the magic word" according to others in the tourism field. The forest walk was wonderful and a necessary diversion from the busy town, and the short hike up to a view point was well worth it. Highly recommended.